Whilst I’ve done some work in the past around evaluation I’ve needed to brush up on it since joining the Mozilla Foundation. This post reflects some hours spent in Durham University Education Library earlier this week. Is there a written description of what is to be evaluated? What is the status of the evaluand? Relatively stable and mature? New? Developing? How long as the program been around? In what context will (or does) the evaluand function? Who is the evaluand designed to serve? How does it (the evaluand) work? Or how is it supposed to work? 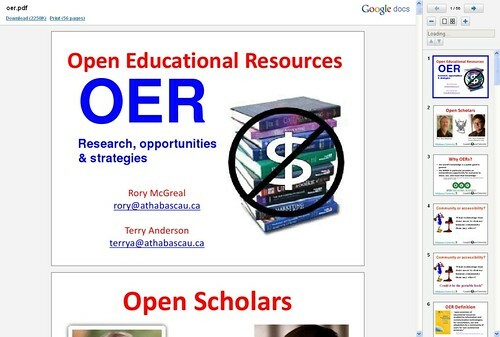 What resources are being put into the evaluand (e.g. financial, time, staff, materials, etc.)? What are the processes that make up the evaluand? What outputs are expected? Or occur? Why do you want to evaluate it? Whose description of the evaluand is available to you at the start of the evaluation? Whose description of the evaluand is needed to get a full understanding of the program to be evaluated? There are many dimensions to evaluation, the most commonly known being summative vs. formative evaluation. Whilst formative evaluation has as its audience those within the program being evaluated, the audience for summative evaluation is those outside the program (such as policy makers, funders, or the general public). The last bullet point of this list has many books and articles dedicated to each element. Very basically, quantitative evaluation focuses on ‘hard’ numbers, whereas qualitative evaluation focuses on ‘soft’ experience. Does what is provided meet client needs? What happens when it is in operation? Does it attain its goals or objectives? How do costs and benefits compare? Does it meet required standards? He also suggests including the names/contact details of the evaluators. This brief overview of evaluation should enable me to be more confident when evaluating things for my day-to-day role. Hopefully it’s also given you enough of a starting point to carry out your own evaluations. Not everything is broken. Not everything has a dark, fetid underside. Not everything is a commoditised, market-influenced mess. What I try to communicate (here and elsewhere) is the importance of recognising how inter-connected and inter-dependent we are. I think it’s far too easy to focus on the former without recognising (and acting upon) the latter. For example, I’m delighted that TeamGB has met with so much success at the 2012 Olympic Games. But it’s far from merely a collection of individual performances. There’s infrastructure involved. There’s interdependence. There’s solidarity. Many of our athletes rely not only on British infrastructure, but that of other countries – for example British Somali gold medallist Mo Farah, who trains in the US alongside American athlete Galen Rupp. There’s a complicated, tangled, inter-dependent web of human relationships that allow elite athletes to succeed. Let’s take another example. Breakthroughs in science and technology rarely take place solely because of an individual moment of genius. Rather, they occur because (in Newton’s phrase) individuals and teams “stand on the shoulders of giants”. Researchers, academics, technologists – people who work primarily with their brains rather then their bodies – also rely upon a network of human relationships. So forgive me if I complain about journal articles being behind paywalls. Forgive me when I point out that access to the best facilities is reserved for those with privilege, status, and money. Forgive me if I come across as sullen. Somewhat paradoxically, it’s because I care so much about others. 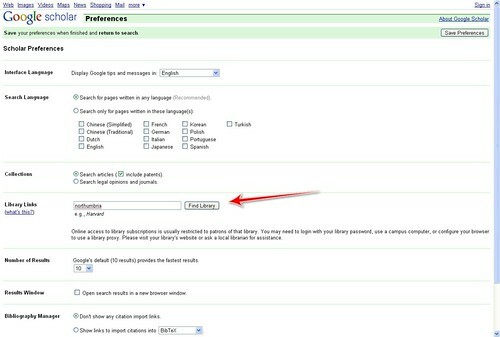 HOWTO: Set up Google Scholar to do the heavy lifting for you. 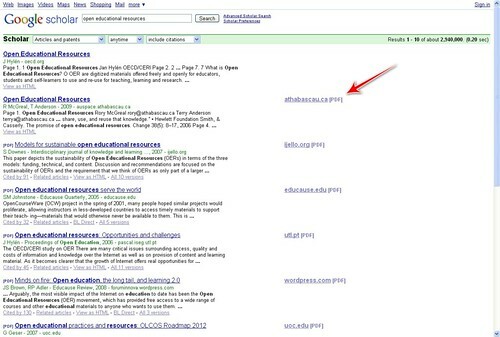 There’s two really powerful things you can do with Google Scholar. The first, which I’ve mentioned to many people many times before, is click on the ‘Cited by…’ link underneath search results. This helps you find seminal papers fast. 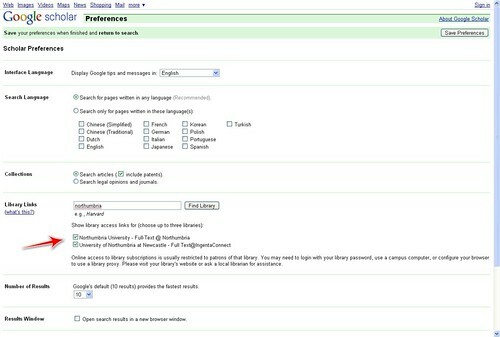 The second is the subject of this post – integrating your access to electronic journals with Google Scholar. I’m fortunate in having two methods now – through Durham University because of my Ed.D. research and now through Northumbria University, hosts of JISC infoNet (for whom I now work). Enter the name of your university/institution in the ‘Library Links’ box and click the button ‘Find Library’. When Google Scholar comes up with some suggestions, click the ones that are appropriate. Then click the ‘Save Preferences’ button. 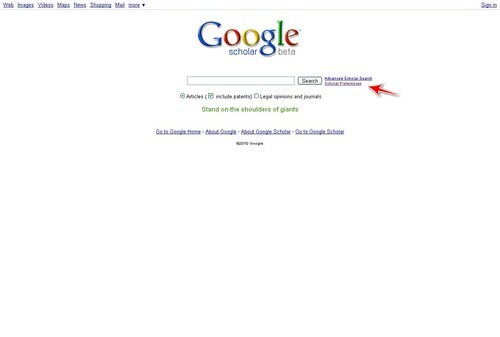 Search using Google Scholar as usual. Links to PDFs, etc. will appear to the right. Click on them and then login using your university/institution password. You will be directed straight to the PDF without having to login to various repositories.